T.E.N. 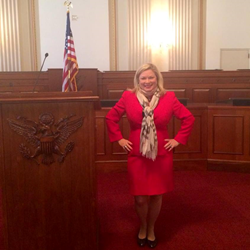 CEO and President, Marci McCarthy, Heads to Washington DC to Advocate for Data Breach Notification Law Standardization | Company Newsroom of T.E.N. Atlanta, GA, February 8, 2018	(Newswire.com) - ​​​Next week, Marci McCarthy, CEO & President of T.E.N. will join the CompTIA DC Fly-In to advocate for national data breach notification laws on Capitol Hill during the association’s annual fly-in to Washington, D.C. CompTIA, the Computing Technology Industry Association, through its advocacy arm, champions member-driven business and IT priorities that impact all information technology companies – from small managed solutions providers and software developers to large equipment manufacturers and communications service providers. As a CompTIA DC Fly-In participant, McCarthy, serving as a Technology Association of Georgia (TAG) representative, will meet with Congressional representatives to discuss the need for uniform and cohesive set of breach notification laws to replace the current disparate mix of laws that vary from state to state. Currently, there is no national standard for how organizations must notify their customers in the event of a data breach. Instead, they must navigate a complex web of different, often conflicting, regularly changing data breach notification laws across 48 states and 4 US territories in the aftermath of a breach. With the increasingly mobile and decentralized nature of the U.S. economy, data storage, and dissemination technologies, it can be nearly impossible for companies to determine which state laws apply when a breach occurs. The current regulatory landscape places not only an immense financial compliance burden on businesses, but also delays the process of getting information into the hands of those who need it most; the people whose data was compromised. “I’m honored to dedicate my time and knowledge to improving the way we as a nation approach data breach notification and streamlining the notification process,” McCarthy said. While organizations of all sizes continue to implement proactive approaches to ensure the security of sensitive data housed on their networks, end points, applications and in the cloud, it is also essential that the current incongruent guidelines and legislation surrounding data breach notification become standardized in order to protect individuals and businesses alike. The Fly-In runs February 13-14, 2018. For more information on CompTIA’s advocacy efforts, visit https://www.comptia.org/advocacy. T.E.N., a national technology and security executive marketing and networking organization, facilitates peer-to-peer relationships between top executives, industry visionaries and solutions providers in the cybersecurity industry. Nominated for numerous industry awards, T.E.N.’s executive leadership programs enable information exchange, collaboration and decision-making opportunities for Information Security Executives and cybersecurity solution providers alike. Its flagship program, the nationally-acclaimed Information Security Executive® (ISE®) of the Year Program Series and Awards, is North America’s largest leadership recognition and networking program for security professionals. T.E.N. delivers ISE® Private Dinners across 42 major cities throughout the U.S. and Canada to create even more opportunities for Information Security Executives, professionals and security solution providers to Connect, Collaborate, and Celebrate. For more information, visit http://www.ten-inc.com. The Computing Technology Industry Association (CompTIA) is the voice of the information technology industry. With approximately 2,000 member companies, 3,000 academic and training partners and nearly 2 million IT certifications issued, CompTIA is dedicated to advancing industry growth through educational programs, market research, networking events, professional certifications and public policy advocacy. Visit CompTIA online, Facebook, LinkedIn and Twitter.